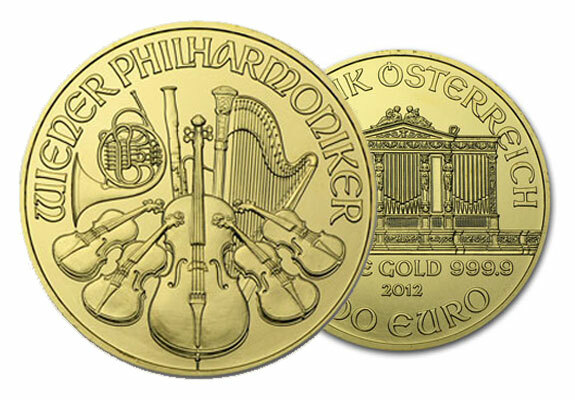 The Austrian Philharmonic Gold Coin represents the harmony between the highest purity of gold and the European touch. Since it first opened its doors more than 800 years ago, the Austrian Mint has garnered an unrivaled authority for producing superior quality gold coins with distinct designs. In 1989, the Austrian Philharmonic Gold Coin was first produced by the Austrian Mint and rapidly became a popular collectible. Since then, the Austrian Philharmonic Gold Coin has gone on to be one of the best selling coins in the world, being the number one seller in 1992, 1995, and 1996. Obverse: A portrait of the great organ inside Vienna’s Golden Concert Hall (Musikverein), the home of the Austrian Philharmonic Orchestra. Reverse: An assortment of orchestral instruments. These musical instruments are situated beneath the words “WIENER PHILHARMONIKER”, the name of the Austrian Philharmonic orchestra in German. Investors and collectors alike regard the Austrian Philharmonic Gold Coin to be one of the most elegant designs of any gold bullion. The Austrian Philharmonic Gold Coin is one of the purest gold coins of regular issue in the world, with a gold content of .9999 and containing virtually no base metals of any kind. To add Austrian Philharmonic Gold Coins to your existing IRA, former 401(k), or Gold IRA, or make a cash purchase for direct delivery, contact American Bullion toll free at 1-800-326-9598 to speak with a precious metals specialist.